Prana Capital Group’s roots are entwined with those of an Arizona-based family office that has been a long-time investor in US equities. A few years ago, this family office began asking some interesting questions and challenging the status quo of some well-entrenched assumptions regarding the topic of market diversification. Challenging the status quo is never easy, but sometimes doing so generates extraordinary results. Our case in point involves finding a more efficient and effective diversification vehicle for an investment portfolio comprised of US equities, The Phoenix Capital Fund. Traditionally, equity positions have been hedged with cash, bonds, real estate, and/or commodities. However, we strongly believe that market volatility, deployed as its own asset class, can dramatically improve diversification characteristics and can potentially create a statistically superior market hedge compared with any of the aforementioned traditional diversifiers. Let’s begin by reviewing the long-term, historical performance of US equities. As shown in Figure 1, the US stock market *, as measured by the S&P 500 index **, follows a continually repeating pattern—an ever-present market yin and yang. Since 1903, the performance of US stocks has generated a series of significant market vacillations—bull market periods and bear market periods, each denoting a directional change in the overall market value of 20% or more. The predominant market trend across this entire period is decidedly bullish, but each of the 12 distinct bull market periods (except for the present one) was followed by a corresponding bear market period during which time the market lost at least 20% of its value. During its most recent bear market, US stocks dropped in value by nearly 50%, and on no less than five separate occasions since 1903, bear market periods delivered investors losses of 30% or more. Other more narrowly focused indexes performed even worse. In only 31 months (March 2000 through September 2002) the NASDAQ Composite index lost an astonishing 78% of its value, and it would take 15 years to fully recover from this loss. So, what can we do to avoid or at least dampen the caustic effects of these bear market periods on our investment portfolios? Modern Portfolio Theory maintains that any given asset class can be best diversified by introducing one or more non-correlative asset classes into our portfolio mix. A simple example of this, long embraced by many institutional investors pursuing long-term investment horizons, is a 60/40 stock-to-bond portfolio mix. Other asset classes offer non-correlative or low correlative returns as well. Figure 2 depicts how these major asset classes have correlated with the S&P 500 over the past 25 years. A correlation coefficient is a statistical measure of the linear dependence between two variables or data sets and is expressed as a number ranging from -1 to 1. A correlation coefficient of 0 means two variables are perfectly uncorrelated. As a practical rule, any outcome between -0.2 and +0.2 is generally interpreted as statistically non-correlative. Correlation coefficients measuring less than -0.5 or more than +0.5 are interpreted as significantly correlated or significantly negatively correlated. So, over the past 25 years, we can see that bonds and cash have been extremely non-correlative with stocks. Real estate and commodities have been positively correlated with real estate exhibiting more statistical significance. Now let’s consider another potential diversifier, volatility—as measured by the VIX index ***. The VIX has some unique statistical characteristics. We can begin with a very significant negative correlation coefficient of -0.6. Over the past 25 years, the majority of the time, whenever stocks have gone in one direction, volatility has gone in the opposite direction. As Figure 3 demonstrates, volatility has a statistical characteristic that isn’t shared with the other asset classes. 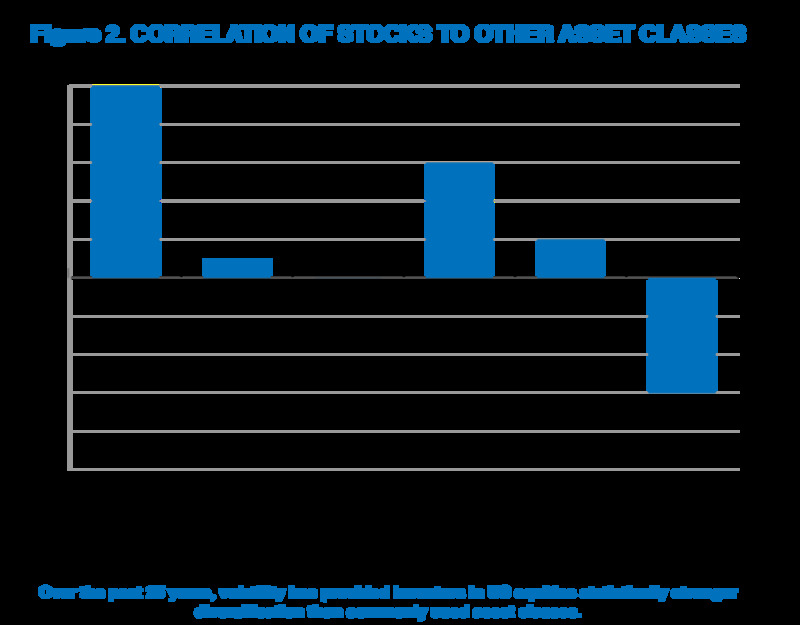 Volatility tends to have a higher negative correlation with stocks when stocks are losing value and a lower negative correlation with stocks when stocks are gaining value. During the two bear markets that occurred within the past 25 years, the correlation between stocks and volatility averaged -0.8. Comparatively, during the three bull markets occurring within the past 25 years, this correlation averaged only -0.2. Thus, from a historical perspective, volatility has tended to rise significantly during market declines, and fall, albeit at a less correlated level when equities rise. Since the launch of the VIX index in 1992, the stock market has suffered two bear markets. The bear market caused by the burst of the tech bubble lasted from September 2000 to October 2002 during which time stocks, as represented by the S&P 500 index, fell 42%. Five years later, the bear market resulting from the financial crisis, began in October 2007 and concluded in March 2009. During this time the S&P 500 index fell 49%. 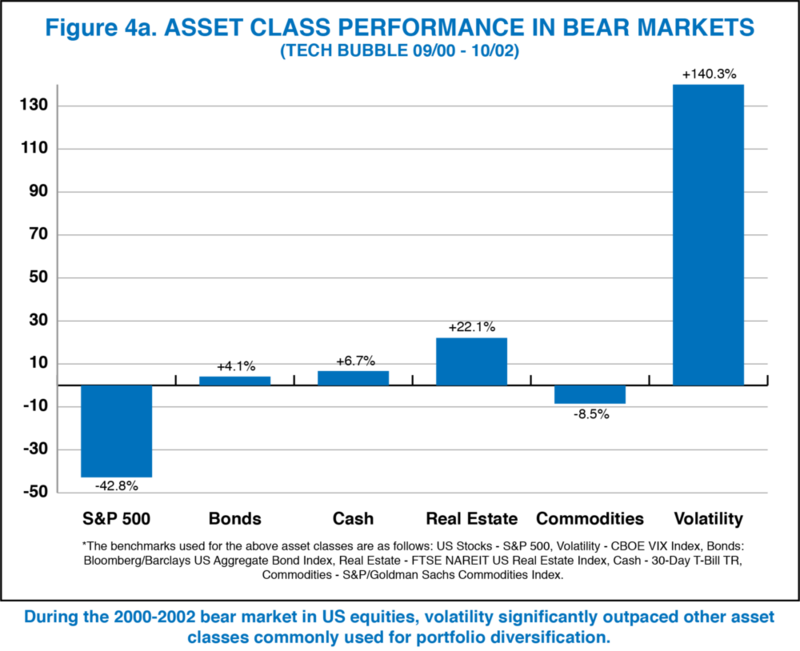 Figure 4a and 4b demonstrate how various diversifying asset classes performed over these same timeframes. Clearly, diversifying using volatility during periods of significant market sell-off has been a much better play over the past 25 years than attempting to diversify using any other asset class. However, it is important to note that because volatility is also negatively correlated with stocks during periods of market advance, you will give some of this return advantage back during bull markets—especially if you do not adequately manage your volatility position. Now let’s consider one last set of data. Figure 5 demonstrates that for the past 25 years, the VIX index’s daily change, on average, was very similar (albeit inverted), relative to the S&P 500 irrespective of whether the S&P 500 advanced or declined on any given day. It is our view that the symmetrical pattern exhibited here is suggestive of volatility being a very significant and reliable diversifier of US equities. Finally, while some of this data may be a bit complex, the results are very compelling. Because of its persistent and profoundly negative correlation with US stocks, and because the magnitude of this negative correlation tends to grow in scale when equities are declining in value, we feel volatility offers a much better hedge against a declining equity market than any other broad asset class over full market cycles. The Phoenix Capital Fund is hedged against the possibility of a market downturn 100% of the time. If the market drops precipitously, the value of the VIX index rises as equities and volatility are negatively correlated (-0.8 correlation coefficient during bear markets), creating a superior equity hedge. Click here to read “Harnessing Volatility As A Means of Capturing Incremental Alpha,” how a well-managed volatility strategy can create Alpha over full volatility cycles. ** Market return calculations were created using monthly data points and the S&P 500 index. *** The VIX index was developed by the Chicago Board of Options Exchange as a means to measure the expectation of future volatility in the US equity market.